The ICN broadcast showed a tape of an interview with Dr. Mornay's Chief Researcher, Dr. Athol Kiley. "Could you tell us exactly how Dr. Mornay got started with his inter-species communication project?" As Dr. Kiley told his story, the ICN monitors showed the scenes that he described. Months had passed since Dr. Mornay's paper had been published in Nature. It brought him notoriety and funds for starting his project. He worked quickly to assemble a team. I was one of the first three researchers he hire to begin working on the inter-species communication project. He had located a building in Irvine to house the project team developing the computer hardware and software. We were assembled in the auditorium of the Inter-Species Communication (ISC) Laboratory to hear his charge to our newly formed project team. "The first step to inter-species communication with the cetacean species (dolphins and whales) is to create a device for phizualization," Dr. Mornay began his speech to us, "a machine that will allow humans to see the visual patterns that dolphins create with their phonations. They transmit high frequency sounds that bounce off their surroundings. Upon receiving the reflected sound waves, they convert them into images. The large auditory cortex in dolphin brains creates high quality visual images comparable to human sight. "The device will consist of receivers similar to those used to view babies in their mothers' wombs, using ultrasound receivers to feed signals to neural network software that will resolve the signals into 3-D spatial information and display the results on full color computer screens. "Medical research teams have just recently developed techniques for creating realistic views of the insides of a beating heart using ultrasound machines and computers. They can literally stand inside of a baby's heart and examine a defect from several angles while the heart beats. The process used for creating these images duplicates the process that occurs in the dolphin's brain. "The dolphin sees by constructing a 3-D virtual reality surrounding itself from the reflections of the high frequency sound it emits from its phonation organs. This process is similar to what happens in the human brain. We walk inside a 3-D world-space because of a unconscious process of 3-D image creation that occurs in our brains. Were it not for that process, we would be like a prisoner in a brig on a ship, viewing the outside world as flattened images on a glass porthole cover. "An explanation of how human sight works may help you to understand how we will build the machines for dolphin vision. "Years ago an experimenter put upside-down glasses on a human subject. The glasses covered his entire field of vision and turned his view of the world upside down. He wore them night and day for several months. At first he was completely disoriented, but gradually he learned where things really were and after a week or so he could maneuver around his house fairly well. "The remarkable thing was, after three weeks his entire field of vision flipped and the world was turned right-side up again. His vision had returned to normal; he had experienced a complete inversion of signals in his brain. The researchers were amazed at this unexpected turn of events and had him remove the spectacles to stop the experiment. To their amazement, without any glasses on, his world was now upside-down and it stayed that way for the same three-week period. "Now, what had happened? Obviously something transpires in the eye-brain connection other than a simple transport of an image from the back of the retina to some viewer in the brain. That's the simple photographic analogy we saw on those colored charts in grammar school. What could there be in the brain to view such an image? A homunculus? That explains nothing. The little man would require all the image processing tools as the brain itself. "To understand what is happening, consider the following thought experiment. It could be actually performed with the present technology, but my point can be made from merely describing it. "In a dark room place a cube on a table and shine laser light on it. Reach out and touch the cube and you feel it - it's there, right where it seems to be. Now create a hologram of that cube by splitting half of the light with a half-silvered mirror and shining both the direct and reflected beams of laser light on the cube. "When you then expose a piece of photographic film to the light reflected from the cube, a curious pattern is exposed on the film, consisting of a series of interwoven smoke rings. This process is called holography and the piece of film is called a hologram. "If you were to shine the laser light through the developed film of the hologram, the cube would appear to be on an empty table. The 'holo' is from the Greek meaning whole, because one of the features of a hologram is, if you cut a piece off the film, any piece, and shine light through it, the whole cube appears. "Researchers into brain function such as Karl Pribram theorize that the human brain stores information in holographic form because no trace of an engram or memory trace has ever been localized in the brain. "Now imagine that you remove the cube from the table and shine the laser light through the hologram, what happens? The cube appears on the table exactly where it was when the hologram was made. "The remarkable thing is that when move around the table, you see new portions of the cube that were not visible before from your previous points of view. A complete 3-D representation of the cube appears in space and the only way to decide if it's a real cube is to reach out and touch it. Of course when you do, nothing's there, only empty space. "If you now slide the physical cube carefully into the holographically created cube image, you have a holographic picture of a cube that exactly coincides with a physical cube. You see a real cube and can be persuaded by touching the cube that the image of the cube and its invisible physical body are one thing." "Why is this important?" a member of the project asked from the front row. "Because this mechanism of lining up a constructed 3-D representation of the world with the otherwise invisible physical world is how our visual apparatus works. The human eye can not see any more than the dolphins' ears can hear. "All our eyes do is transmit the absorbed energy of the impinging light waves to our brain where a 3-D holographic image of the world is constructed and aligned with the real world. "We posit that the same process that makes vision possible for humans, with their visual apparatus, makes vision possible for dolphins with their auditory apparatus. The relative sizes of the visual and auditory cortices in the human and dolphin species are reversed, suggesting a reversal of function. "The visual cortex of humans is about the same size as the auditory cortex of dolphins, and this is a strong indication that their capabilities are equivalent. On the other hand, the auditory cortex of humans is about the same size as the visual cortex of dolphins, indicating much less visual capability in dolphins compared to their auditory. and much less auditory capability in humans compared to visual. "The relative size of the human and dolphin cortex is common knowledge, but what I wish to explain to you today is my understanding of how that enormous auditory cortex in dolphins is used: it is used to create high quality images of their world, comparable to the visual capability of a normal sighted human being. "Having a large auditory cortex permits the processing a lot of information in a small amount of time, what is called a large bandwidth. This was one strong hint I had about how dolphin communication worked. "I suspected that the early Lilly experiments of trying to slow down the high bandwidth auditory output of dolphins to pick out words was equivalent to a naive electronics experimenter trying to slow down television waves to make them audible to the human ear. "The poor dolphins were being painstakingly taught to say Hello and were getting as close as they could by blinking certain pictures on and off in a given pattern. How foolish they must have thought humans to be. How foolish we were then. This new project gives us all a chance to correct a mistaken impression that humankind has had of dolphins, up until now. "Back to the cube experiment. If you're still not convinced about the lining up of visual images with the real world, try a little experiment right now. Place an index finger to the outside lower side of one of your eyeballs and apply a sight pressure. What happened? Two images of the world appeared, right? Which one was the real world? Which one would you hit a bull's-eye with if you aimed your arrow at it? Only one could be the real world, but there are two to choose from. If you had double vision and shot many arrows at both images, soon you would know which one was real and which one not, and in a normal brain, the unreal image would disappear. "This is, I suspect, the normal progress of an infant learning to use its visual apparatus for the first time. It has long been noted that all infants are cross-eyed at first; what is likely happening while they are cross-eyed is that their eyes and brain are attempting to line up the images with the real world. "In the experiment with the upside down glasses, the key element was that the subject was allowed to manipulate the world while the world was upside-down. If they had prevented him from manipulating the world and seeing his upside down body and had able to eliminate the strong directional signals of gravity, his brain would have never flipped the image over. "It is by use of redundant information in the environment that we can align our visual images with the invisible real world so accurately. The reason we see a cup on a table exactly in the place of the physical cup is because our brains have already adjusted, or calibrated, its constructed 3-D views with the physical world. "This is a process that begins shortly after birth, when the baby opens his eyes for the first time. Studies of persons born blind who later in life gain their sight, tell us that their first view is of blurred patches of colored light moving around. This lasts for various lengths of time until they are finally able to identify objects for the first time. "Well, if we call the identifying seeing what do we call the process that led up to their identifying?" "Learning to see?" someone in the front row of the auditorium offered. "Okay, but weren't the same visual signals being sent to the brain during this learning process? This proves that seeing involves three things: a process of visual construction of images by the brain, a training process, and a process of aligning the images with the real world. "To be successful in our endeavor of inter-species communication, we must use all three processes. The construction of images will be done by the virtual reality software, the training by use of back propagation neural networks, and the aligning with the real world by use of redundant information. The coordination of these processes represents the biggest initial challenge in this project. "It is the process of constructing a 3-D visual representation and lining it up with actual objects that we will use as a model for creating a device to allow humans and dolphins to communicate with each other. "Since a dolphin visualizes via its phonation apparatus, I have given that process the name phizualize created from the two words, phonate and visualize. The reason for creating a new word for dolphin hearing should become clearer when we discuss dolphin speaking. "They speak visualizations, a process which is distinctly different from phizualization and which has no counterpart in human experience. Therefore no word to describe it has ever been necessary, up until now. "I call the speak-visualize process, spizualize, again created from its root words, speak and visualize. Dolphin researchers have long suspected the existence of a phizualization process in dolphins -- they called it echo-location — but no evidence is available to suggest anyone suspected the existence of the spizualization process until I wrote my first dolphin paper. "What gave me the clue about the existence of spizualization is described in detail in my paper, but I will summarize it for you here. "In the northern Pacific ocean two groups of naval ships that had been modified for whaling were separated by several hundred miles. In each group of ships one ship had a harpoon gun mounted on its bow, but was identical to the others in every particular, paint, color, size, shape, etc. "There were whales swimming among the ships in both locations until the harpoon gun was fired from one of the ships killing a whale. Immediately in both groups, the whales moved away from the ships with the harpoon guns, but stayed swimming among the ships without the harpoon guns. "How did the whales communicate across miles of ocean to the other group to tell them to avoid the ship with the harpoon gun? "If we assume that the communication between the two groups of whales was done in human fashion with words, we must presume that whales have an enormous vocabulary of words that enabled them to describe this ship and its harpoon gun, and to describe the killing of a fellow whale. What I puzzled over when I read this report was how the whales did this. "While discussing my quandary with my wife, Ingrid, she suggested that if whales can hear pictures, perhaps they can also speak pictures. "From this hint I came to postulate the following scenario: that the whales had transmitted a picture, sort of a newsreel clip, of the shooting of the whale by the ship with the harpoon gun. When the whales received this news flash, they naturally avoided any ship that had the same structure on its bow. "This episode gave me the first glimpse of the possibility that cetaceans speak visual images, or spizualize, to each other. They see their surroundings and see other dolphins' speaking to them via visual images, constructed from auditory inputs. Thus I came to create the model for how dolphins communicate and that's how this project for inter-species communication came into existence. "But I get ahead of myself slightly. Go back to the simple cube in the dark experiment with me to help tie this together. A dolphin phizualizes the cube on the table by phonating or radiating sounds at it and resolving the received reflected sounds from the cube into a 3-D image in its brain that corresponds in space with the location of the cube. "Real dolphins first learn to do this with fish, not cubes, of course, since fish are essential to its survival, but for simplicity's sake, let's talk about cubes. Having received the sound waves reflected from cubes often, the dolphin learns to mimic the sounds made by the reflected cube. These re-created sounds, when heard by another dolphin, are resolved into an image of the cube, perhaps with some slight change or characteristic that lets the dolphin know that it is a spoken image he is viewing. The listening dolphin will then see a cube even though no cube is there — just like in the experiment with the light shining through the hologram. This spoken re-creation of an object or scene is what I have called spizualization. "By the way, this explains the politeness of dolphins when they meet in what are called dolphin conferences. Dolphins must take turns speaking because they are creating 3-D visual images that surround the listeners. Just like humans sitting around a campfire, no one would not interrupt a good yarn being spun by somebody else, and the group would not condone two people speaking simultaneously. Such campfire stories that conjure up images of other times and places are the closest humans get in conversation to the process of spizualization. "Since starting this project I have paused many times to observe fellow workers using their hands and words to create a phantom in the space in front of their eyes. The phantom is a 3-D sketch of the machinery they are describing to each other. 'Here is where the widget goes into the sprocket,' they say, as their hands shape the widget and sprocket. This is how humans spizualize. "Movies are another way. A movie director is a master of spizualization. Via television and the movies, humans create their visualizations in image form supplemented by words to conjure up images of not currently visible parts of the visual image. This leads me to suspect that dolphins, whose brain capacity exceeds humans in relation to body weight, must have visual means for adding components to a spizualized scene to suggest possibilities. Through some visual artifice, color perhaps, or some vignetting, they are likely able to express the tenses of our English verb forms, past, present, future, etc. Exactly how they do this will have to wait for the operation of the communication equipment to determine their capability in that area." "Dr. Kiley, was there any one part of the inter-species communication project that stood out in your mind?" Dr. Mornay had been searching for years to an answer to this question, "Why do dolphins beach themselves?" Just as you, as a broadcast journalist, might spend minutes composing a question to ask a head of state at an important press conference. But with this difference — Dr. Mornay was attempting to spizualize the first ever question for a dolphin, choosing to use Nimrod for the assignment. To spizualize any dolphin communication was difficult enough: it took hours of preparation to create the visual images in the computer that would be broadcast so that the dolphins could see them. 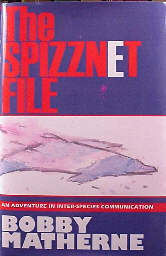 Spizualization, the dolphin's means of talking, was more difficult than phizualization or hearing because hearing is more of a passive activity, simply converting reflected sounds into visual computer images. At least it seemed simple once all the technical details and back-propagation networks had been tuned and calibrated to our ultrasonic pickup devices. But spizualization is an active process that requires the human operator to create an entire visual field and populate it with objects and images to be "talked" about. Dr. Mornay said in his public speeches, "Phizualization is as easy as watching a TV show and spizualization as hard as making a TV show." Since the first-ever question was being taped at ICN's request for this world-wide broadcast, it was important to Dr. Mornay that we get it right. At this point in time, we were only three weeks away from our broadcast. We might run out of time and not be able to re-phrase the question in time for the broadcast, and we very much wanted that question on the first broadcast. Often lately Dr. Mornay had watched teams of people trying to save dolphins from dying after they had beached themselves on some coastline. He knew intuitively that one dolphin beached might be an accident of nature, but not a half dozen at the same time. To him there was some underlying principle at work, and he hoped that we'd find it out from Nimrod shortly. If the answer could also make it to the broadcast, so much the better. Dr. Mornay had shown us how to ask one word questions before of Nimrod. His technique was to capture the fish portion of the 3-D image and to repeat it immediately. The first time he did it, Nimrod expanded his nasal cavities and his stomach oscillated in a rapid fashion that Dr. Mornay had come to recognize as laughter. Remember: Dr. Mornay is phizualizing via his monitor the body of Nimrod during this episode, and thus he had a visual image of his nasal cavities and other internal organs. Once he stopped his laughing, Nimrod spizualized the same fish in pink, rather than its normal blue-green color. Dr. Mornay told us he was unsure what to do, but on a hunch he changed his fish's color to pink with his sensor glove, and Nimrod chuckled with delight, all his cavities wiggling — he said he could almost discern a trace of a smile on Nimrod's face. Nimrod went off into a long sequence of images, a sequence that Dr. Mornay soon realized was an answer to the question, "fish?" Then it hit him, "pink" was the question mark, the mark that a question had been lodged! Like the change of inflection in human speech, a change of color was used by dolphins to signify a question was being asked. To ask a question in dolphin, you simply changed the color of the object you were spizualizing to pink. Since pink is such an unusual color for the dolphin's world, there is no conflict of signals. Until almost pink humans appeared, that is. As Dr. Mornay and the project team were to find out much later, when we began to have long conversations with Nimrod, humans were a continuous question mark to dolphins because their color so closely matched their question mark color. Merely to spizualize a human to another dolphin was to ask a question about them, and dolphins, naturally curious already, would flock around any nearby humans to attempt to answer that question. It helped us to understand better the long historical attraction of dolphins to human beings. Dr. Mornay's big question was simple, but it involved a complex idea and he was not sure how it would be received or answered, so we took our time with it. His creating pictures with the spizualization apparatus was coming along slowly. The new control system that Rich and I had recently installed required retraining of our fingers and hands. But the new 3-D icon menu setup had objects floating in space around his peripheral vision, and it was fairly easy to maneuver with a little practice. At Dr. Mornay's suggestion, I arranged the 3-D icons in a circle according to the location of eye-accessing cues that Richard Bandler taught in his neuro-linguistic seminars. If you imagine the icons to be on the face of a large clock, the eidetic or remember visual icons are in the upper left quadrant, the nine to twelve o'clock sector. From the circle of icons in his peripheral vision of our eyephone virtual-reality screen, we could retrieve stored images, modify them, and store them for future use. If we wanted a dolphin image, we could pull the cetacean icon, then chose the dolphin icon from the selection of whales, porpoises, and dolphins. The last display contained specific dolphins, such as Nimrod and Demeter, the two primary research dolphins at this time. Although this may sound like a complicated method of talking, Dr. Mornay says it's about the same order of difficulty as speaking in American Sign Language. With a few deft passes of our hand we could quickly spizualize Nimrod and Demeter in the pool swimming around each other. We feel like a director of a movie whenever we spizualize using this equipment, and, in a way, we are. To build created images, we use our right hand and manipulate objects in the twelve to three o'clock quadrant of the icon menu. This took the greatest amount of training to become quick at, but it was a skill like any other and our facility grew with practice. Dr. Mornay spent the most time on the device and has mastered it quite well. At the nine o'clock position is the icon for recovering remembered conversations, parts of sentences previously created for instant access. This is useful but requires a method of quick retrieval from the maze of possible images. Our solution was to build a relational data base with a visual query-by-example interface to the dolphin image collection that was being accumulated. Rich had the query subsystem in prototype form about a month before the broadcast, and Dr. Mornay and I were looking forward to testing it. We hoped some form of the new query system would be ready for the ICN broadcast so that we could use it quickly to respond to any unexpected questions that might come up during the live interview with Nimrod. In the six to nine o'clock sector were the auditory icons. These were the dolphins' version of music, in other words, visual music, fluid visual sequences of images. Mornay had observed this occurring in dolphin spizualizations, and guessed it was a kind of music. He had noticed that whenever Nimrod created such a sequence, Demeter would add objects to the scene and the two objects seemed to dance with each other. Dr. Mornay theorized that the two components of the scene added by the different dolphins were like the separate notes that when played simultaneously create a chord in human music. That led him to say that dolphins sing ballet, that is, when they harmonize their vocal output, they are spizualizing sequences of images that dance with each other's images. When one dolphin starts a song, a single ballet dancer appears, then the second dolphin joins the music and a second ballet dancer appears and dances with the first dancer. Rich had suggested they create phizualization of whale songs using commercially available record albums, but Dr. Mornay explained that the frequency response of audio CD's was much too restricted to create any images in the phizualization apparatus. But one project we have scheduled is to record whale ballets live when the ICN broadcast is over. The three to six o'clock quadrant of the icon menu contained the kinesthetic or feeling image creation icons. It was a mystery to us how dolphins felt, but we were sure that they felt in some way. They must have kinesthetic and visceral reactions to events in their environment, he thought. They certainly seem to respond with laughter at the right times, and that is a form of kinesthetic experience. I asked Rich to reserve that quadrant for future kinesthetic icons as we discovered how the dolphins' feeling system works. At that time, there was only a pink dolphin icon that served to ask questions about the dolphin's feeling state. The first time Dr. Mornay used the pink dolphin icon to ask a dolphin a question, it was with Demeter and she responded by showing a documentary about the history of dolphins. Then he showed her a pink Demeter icon and she gave a brief autobiographical sketch. Dr. Mornay was distracted and moved his finger across the icon too fast and the question came out as a blue-green dolphin icon with a brief blip of pink dolphin at the end. This question evoked a response that puzzled everyone at first. Demeter showed a brief sequence of her jumping out of the ocean under a full moon with Nimrod. Further questioning led us to discover that this moonlight sequence was like a single word to Demeter for "joy." What Dr. Mornay had done by his slip of the finger was to ask in dolphin about her here-and-now feeling state and she had answered joy. Rich quickly programmed another icon that blinked pink at the end to enable us to ask feeling questions of the dolphins. Dr. Mornay asked Demeter how Nimrod was feeling using this new system, showing her a Nimrod icon with a pink flash at the end. Demeter responded by showing a Nimrod icon with a pick flash. She had decided to ask him directly instead of answering for him. What fascinated our team that were monitoring the phizualization apparatus was that the Nimrod icon she used was different from the computer generated one. But, after all, she was in love with Nimrod, they thought, and naturally she saw him bigger, smoother, and more sexually prominent than the neutral computer equipment did. In time for this broadcast, Dr. Mornay finished his big question. He had programmed the best he could the question that in its human auditory form went, "Why do whales and dolphins beach themselves and dies?" He had never understood how it was possible for an enlightened and highly conscious creature to be trapped on a beach by accident and to then die because it was unable to return to its watery home. Soon he will have his answer. As the tape faded out, the ICN announcer posed Dr. Mornay's long unanswered question to the Dolphin People. The question was translated into dolphin. Billions of eyes and ears were transfixed to their screens as the answer came. The Human People think of themselves as having come out of the earth, fashioned from clay by the hands of their creator. Thus, when one of them dies, his friends places his dead body into the ground so that his body might decay in the ancient earth from which it came. We Dolphin People came to the sea from land and when one of us dies, our fondest wish is to return to the surface to allow our body to decay in the ancient air. If we become sick while we are far out at sea and were unable to attain the surface to breathe, we drown just as any other mammal. Our desire is to rest our bodies on our ancient soil, as we breathe our last breath of life. Since most of us leave our body while still healthy, and Human People usually don't, they are very puzzled by the phenomena they call "beaching." They seem to think that we have inadvertently navigated into shallow water and need their help to return to the sea. Thus they come to the beach to guide our departing brothers and sisters back into the water to "save" them from death. Even when some of us swim right back up on the beach repeatedly after having been "saved" by the Human People, they still persist in their folly. Since the Human People have a society that views death as bad, rather than as a natural process, they assume that all death must occur by some sickness or accident. They treat suicide, death by individual volition, as a sickness, something to cured of. We Dolphin People hold the belief that death is an individual decision and that all deaths are suicides. We work for the day when the Human People would come to know this as well. In the 1980's, through our dream work with a scientist in Los Angeles, we gave her the courage to report the findings of her study of single car fatalities. It showed that in over eighty-five percent of the accidents, the lone occupant that died in the crash had had a previous suicide attempt. This statistic helped some of the Human People to understand that all deaths were at their root suicides, but the percentage that believes this is very small, up until now.